Oh, Midlands Beer Garden, you have peered directly into my soul with this one. The Washington, D.C. bar announced it will team up with Anheuser-Busch InBev-owned brewery Devils Backbone Brewing Company this Saturday for a “pup-up” event featuring puppy bartenders, adoptable dogs, a dog treat bar, and more, all in the name of National Puppy Day. The most crucial detail is those doggie bartenders, who will deliver cans of Devil’s Backbone Gold Leaf Lager; a portion of proceeds from those sales will benefit City Dogs Rescue. The dogs will be outfitted with beer-holding vests and will be assisted by “Pup-Backs,” also known as Devil’s Backbone employees. Attendees are encouraged to bring their own dogs, who can have their portraits drawn, snap a photo in the dog photo booth, enjoy treats from a dog bakery bar, and win giveaways of Devil’s Backbone-branded collars, leashes, and bowls. 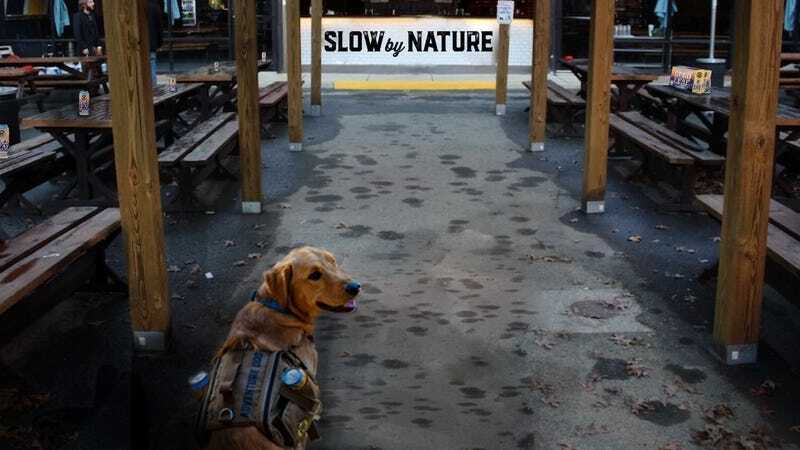 A press release from the brewery notes that Midlands’ patio is heated, as though people wouldn’t sit out in the cold for the chance to order a beer from a dog. The event is part of a larger dog-centered initiative from Devil’s Backbone, which has an “Adventure Dogs” contest open for submissions now through March 22. Five dogs will be chosen to have their likeness used on a Gold Leaf Lager can; the brewery says more than 6,000 dogs have already been entered. I’d raise a beer to that. Pup-tender, can I get another round? On a related note, does anyone know how to train a 9-year-old Labrador to retrieve beer? My favorite restaurant served the worst meal of my life. Now I&apos;m torn.